Obviously, an unrestrictive nozzle will pass a greater flow rate of water through it, all other factors being equal. In an electric circuit, less resistance will pass a greater flow rate of electrons (current) for a given amount of "pressure" (voltage). Water flow is not a perfect analogy for electricity, but is close enough to be useful in basic electricity education. Be prepared to discuss the inadequacies of water as an analogy with your students (i.e. "How come electrons don't spill out the end of an open wire like water spills out the end of an open hose or pipe?"). The raw data figures were made intentionally "noisy" in this problem to simulate the types of measurement errors encountered in real life. One tool which helps overcome interpretational problems resulting from noise like this is graphing. Even with noise present, the linearity of the function is quite clearly revealed. 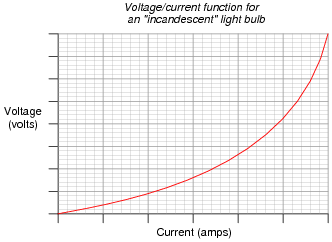 Just a simple Ohm's Law calculation here - no tricks! The point of this question, however, is to get students to think about the steps they follow in doing the calculation. Many students simply wish to memorize procedures rather than learn why to do what they need to do to answer such questions. It is your task as the instructor to challenge them beyond memorization, and through to understanding. What is the value of this resistor, in ohms (W)? Resistor value = 2700 W, or 2.7 kW. One format of component value expression popular in Europe is to replace the decimal point with the metric prefix, so 2.7 kW would be represented as 2k7 W. Not only is this notation simpler, but it also transcends the interpretational difficulties experienced between Europeans and Americans with their opposite usages of commas and decimal points. Some students might not realize that in Europe, commas are used as decimal points and visa-versa. Thus, two thousand seven hundred would be written as 2,700 in America and 2.700 in Europe. Conversely, the number p would be written as 3.141593 in America but 3,141593 in Europe. Confusing? Yes!! The 250 W resistor will experience a current of 40 mA, while the 800 W resistor will experience a current of 12.5 mA. As an instructor, I was very surprised to hear many beginning students claim that all current would go through the lesser resistor, and none through the greater resistor! The proverb about "takes the path of least resistance" really should be understood as "proportionately taking paths of lesser resistance." People new to the study of electricity often misunderstand such basic principles, their errors usually based on folk wisdom like this. It is imperative to break through these myths with hard fact. In this case, Ohm's Law serves as a mathematical tool we can use to dispel false ideas. Many types of electrical and electronic components experience changes in electrical resistance over their operating ranges of current and voltage. Resistors, while simple to study, do not exhibit the behavior of most electronic components. 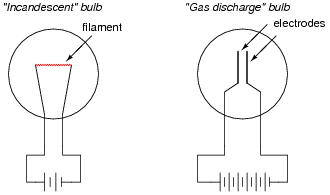 It is important for students to understand that the real world of electricity and electronics is much more complex than what Ohm's Law might suggest (with an implicit assumption of fixed resistance). This is one concept that graphs really help to illustrate. One of my goals as a technical educator is to encourage the development of experimentation skills in my students. The most accurate way to gain knowledge of a device's operation or of an electrical principle is to build a circuit that actually tests it. I've used this technique many times in my career to further my knowledge on a subject, and it has proven to be an invaluable skill. 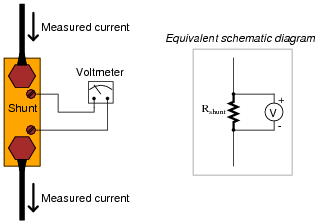 Where to connect a meter to measure lamp voltage. Where to connect a meter to measure lamp current. How to make the current adjustable, so that multiple values may be tested and plotted. 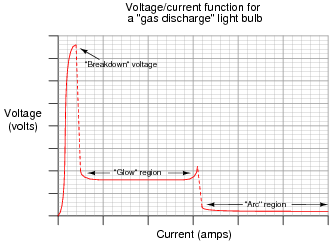 Additionally, the students must identify what voltage/current ranges will be necessary to test a gas-discharge lamp. Notice the high-voltage power source shown in the schematic diagram. Students may ask "How high must this voltage be?" upon seeing the schematic in the answer. Don't tell them outright. Rather, have them do some research and report the next day on typical lamp voltages! "Negative resistance" is where an electrical component passes less current as the voltage dropped across it increases. In calculating the answers, I held to proper numbers of significant digits. This question is little more than drill for students learning how to express quantities in scientific and metric notations. Now, algebraically manipulate the given equation to solve for R in terms of G, then use this new equation to work "backwards" through above calculations to see if you arrive at the original values of R starting with your previously calculated values of G.
Ask your students to show you exactly how they manipulated the equation to solve for R. The last instruction given in the question - working backwards through the five calculations to see if you get the original (given) figures in degrees Celsius - is actually a very useful way for students to check their algebraic work. Be sure to make note of this in class! 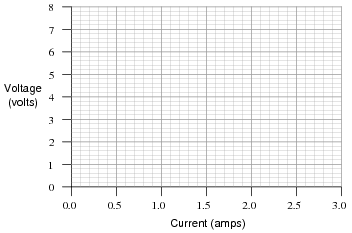 Suppose an electric current of 1.5 microamps (1.5 mA) were to go through a resistance of 2.3 mega-ohms (2.3 MW). How much voltage would be "dropped" across this resistance? Show your work in calculating the answer. 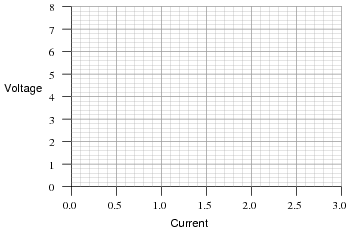 1.5 ×10-6 amps of current through a resistance of 2.3 ×106 W will produce a voltage "drop" equal to 3.45 volts. It is important for students to understand that metric prefixes are nothing more than ßhorthand" forms of scientific notation, with each prefix corresponding to a specific power-of-ten.